The best baby swing is the secret weapon every new mother needs. Everyone knows that babies relax when they're moving about, especially in a rhythmic, back and forward motion. It's been used for hundreds of years to calm children, and it's so effective it even works on adults! Consider how we instinctively cradle and rock someone who's unhappy. Scientists have recently worked out exactly why this happens. It turns out that when we're moved in a rocking motion, it's the same sort of movement that you'd feel when your mother carries you, and this motion releases feel good emotions into our bodies! But we don't need to know why this works, only that it does. So many moms swear by baby swings that we consider it an essential tool in any moms arsenal, whether you're going to be using it to calm your baby down when they're having a grumpy moment, or just help ease them off to sleep at nap time. Whatever you think you might need it for, the fact is that you do definitely need one. We'll explain why below. Or if you already know why you want one and what to look for, skip the next section and head straight to our reviews to find out which swing is right for you. First, What Is a Baby Swing? Obvious question, with an obvious answer. It is a comfortable seat attached to a frame and a motor that swings the seat backwards and forward to relax and calm your baby. A lot of swings have multiple speed settings, as well as other things to entertain and interest your infant like built in sounds, music and toys. Like we just explained, the rocking motion that comes from sitting in a baby swing instinctively calms and relaxes a baby. It's uncanny to see a child that was howling just a second ago cooing and smiling at you again just because you've sat them in a swing, strapped them in and started it rocking. Baby swings are great for mothers who have busy lives, because it keeps your baby comfortable and relaxed whilst you're working. They're enjoying themselves, they can see mommy, and you can keep an eye on them no matter what you're doing, safe in the knowledge that they're not going to get anywhere they shouldn't! 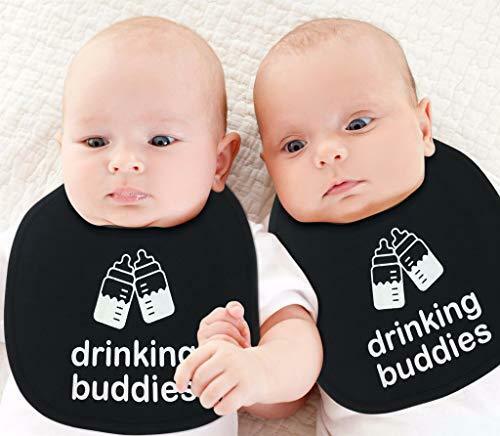 They are also amazing at sending your little one to sleep. You'd rock your child to sleep if they were having trouble drifting off, right? Well they can do that for you, which is perfect if you've had a long day and your arms are suffering! That Sounds Great. How Long Can I Leave My Baby in Their Swing? It is great, but don't get over reliant on them. Experts advise that you should only leave your baby in their swing for less than an hour a day, otherwise you might impair important motor skill development like crawling and climbing. You want it to be comfortable to sit in. After all, your child isn't going to be able to relax unless they're comfy. Look for deep seats that give great support, especially to the important neck and head areas. It's also worth seeing how big the seats are, and how heavy the swing can take. Some of our favorite swings actually adjust themselves based on how heavy your baby is getting! It's also nice to be able to recline the seat. Good baby swings all have this option, so it's something to look out for. Front to back? Side to side? Both? How many swing speeds does it have, and how easy is it to adjust? Can You Rotate the Seat? Some swings are fixed, with the seat only ever facing forward. But others can be rotated to face the sides, or even be rotated fully around. This makes it much easier to adjust as well as allowing you to keep an eye on your little one, no matter what you're doing. There's two options. Mains power and batteries. Batteries are good for portability, but can be expensive to keep replacing. The top swings will have both options available. Does it play songs, and how many? Does it have soft toys or a mobile, or maybe something else? Some swings even have the option of a toy bar, whether built in or available to buy separately. How Easy Is It to Move and Use? Baby swings aren't very heavy, but the easier it is to move about, the better. Some swings have better options like carrying handles or the ability to fold down so you can fit it into your car. Like everything that's around your bundle of joy, expect your swing to take a beating. It's a baby product, so most swings are pretty robust and tough anyway, but the tougher the better. Plus, the safest swings are made from the toughest materials with heavy duty harnesses. There's going to be accidents, so you're going to need to be able to clean it. Good swings have removable seat covers that you can throw into the washing machine, and simple, open frames that are simple to wipe down and disinfect. Considering the price, and that it's made by Fisher Price, this is, in our opinion, the top baby swing out there. It's got literally everything both you and your baby are going to need for them to be as comfortable and happy as they possible can be. First off, it's super comfortable, with a really deep seat with plush supports for both the head and body. Then you look at how she swings, and this model goes front to back and side to side at any of the six swing speeds, so whatever your child prefers, it's all there. You can rotate the seat, just by pressing a button, so if you're busy ironing and want to keep an eye on your little one, or just want to stay in their vision to keep them happy and relaxed, it's as simple as using one finger. One thing I absolutely love about this is how it's got a built in sensor that can see how much your baby weighs and adjusts the speed of the swing. This means as your baby gets a little older and heavier, they get the same relaxing swing speed that they're used to. It's just a really smart design choice. You can power it from the mains, or with batteries too, so if you're looking for a portable model, this fits the bill, and it's all fully washable too, including the removable seat covers, in case of little accidents! There's also a load of things to keep your baby entertained. Built in music and nature sounds, an adorable little mobile at the top, and a mirror in the middle of it all so your baby can see how happy they are to be in this. It really is just great, and if you've wondered at all what swing you can get that's going to be best for your baby, this baby swing really is an amazing choice. I'd always recommend it! We live in the future. The phone in your handbag is more powerful than the computers we used to land men on the moon! And now you can use that technology to keep your baby smiling and laughing all day with the mamaRoo. First, the elephant in the room, (and no, not the blue one hanging off the mobile!) Yes. It is expensive. But yes, it is worth it. Hell, you'd wish you could buy one of these and use it as your own personal relaxation chair. It's got 5 patterns of movement, that are all unique and have been designed to mimic natural patterns, including being carried by mommy or swinging side to side like you would when you're trying to comfort and calm. Plus the seat recline is infinitely adjustable, going from sitting high to fully reclined, and anywhere in between. But the thing that sets this apart from normal baby swings? The reason it's so highly technical? You can control it with your phone! And that's full control. So if you want to speed it up, or start playing music, you can! It plays music from your phone, too, so Spotifying nursery rhymes is literally the simplest thing in the entire world! There are controls on the base of it too, so you don't have to control it from a smartphone if you don't want to, but it's just so easy, especially when you're busy around the house, and it makes life so incredibly simple that it's something I can't recommend enough. You have to run it from the mains, though, but that's a small price to pay for such an amazing baby swing. Your baby will love it, family and friends will be impressed by it, and you'll wonder how you ever lived without it. If you're looking for a swing that's got a simple design, is easy to move about, but has everything you'd look for, then you might want to take a look at the Graco simple swing. It's built really simply, with a basic but strong and durable frame that's easy to assemble and really really easy to move about. The seat is comfortable; wide and deep with a 5 point harness that will hold your baby in safely without being uncomfortably tight or pinching. There's a lot to keep them entertained, as well. 6 different swing speeds, from slow to fast, as well as almost a dozen songs and a bunch of nature sounds. There's also a built in mobile that's pleasingly soft and adorably cute. It's dual powered, so you can use the mains or batteries, but be warned that it does go through batteries quite quickly, so I'd only recommend using them if you're away from the house. If you do need mobility though, this is a good swing because of its compactness, ease of movement, and the fact that it does last a good few days on battery power. Overall, this swing does nothing special, but everything it does do is really good. It's well put together, comfy for your baby, and has enough flair in the sounds and swing speeds, that's it's easy to recommend. If you need the best baby swing that you can take anywhere, and that snaps down into something the size of a briefcase in one press of a snappy button, then this swing is where it's at. It weighs barely 10lbs, and it's so small and compact, but that doesn't mean it's not solidly built. Even better, with one press of a button you can unlock it and snap the frame down so it lies flat, meaning you can carry it with just one hand, throw it in the back of the car, take it anywhere at all with you! It's even possible to fit it in a large bag! It's whisper quiet, too. If you've got it on lower speed options, you can't hear a thing, unless you turn on one of the 6 included song choices. It's not much louder at any of the higher six speeds, either. The seat is surprisingly high quality for the price as well. It's made of really soft, durable material that's comfortable and hard wearing. It can carry infants up to around 30lbs, too. But the manufacturers recommend that you don't put any children over around 4 months into this swing, so be careful as your baby gets a little older. It also only runs off of batteries, with no option for mains, so do bear that in mind when you're buying this. Considering what you're paying, and the portability of this swing, it's surprising how high quality everything is. It's relatively tough, hard wearing, comfy to sit in, has its own music, and it's quiet as a church mouse. If you want an easily portable baby swing, even as a spare to take with you when you travel, this is cheap enough that you can pick it up without worrying. And for moms who grab this as a main swing, it's easily good enough to do that, too! We've already looked at one Graco baby swing today, and if you've already read that review you know that Graco swings are durable, well made and have a great set of features as standard. This is a slightly more expensive model than the Graco simple, and because of that you get a lot more as part of the package. It's still got the standard Graco options. 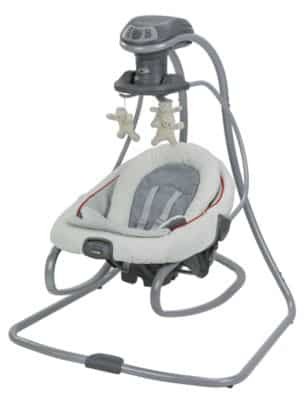 6 different swing speeds with multiple swing directions, a soft and giving seat with a 5 point harness that's incredibly comfortable as well as safe for your baby. A mobile overhead to keep them occupied, as well as 15 songs and nature sounds built in. It can be powered by batteries as well as mains, so you know that you can take this wherever you need it to go and still have power. It's also got a battery powered vibration feature, which is great for sending your infant off to sleep! Where this swing differentiates itself from the Graco simple, and from all the other swings we've looked at, is that you can remove the seat, and the built in underseat frame lets that seat double as a rocker with no extra work or having to add anything else! It's as simple as unclicking it and placing it wherever you need it to be. So if you want to bring baby with you as you move through your house, just pick it up with the built in carry handle and bring the seat, not the whole swing! This portable swing has an easy snap that makes it easy to fold and unfold especially for families that are always on-the-go. It is specially designed for travel, and can also be stored easily. The ComfortRecline enables two positions for your baby and the headrest can be easily removed as the baby grows. You do not have to worry about your baby getting bored while traveling. This portable swing has six melodies that can soothe your baby. It has volume control and auto-shut off. You might have to add more versatile and interactive toys to keep your baby entertained. When you want to keep the baby undisturbed, it also features a WhisperQuiet Technology, which enables the swing motor to run quietly. Another great feature is you can also control the amount of time the baby swings using the handy swing timer that has auto shut-off. This portable swing is made with high-quality plush fabrics for added comfort and to cradle the baby in luxury. This baby swing is compact and space-saving but does not sacrifice the interaction with the baby. It has a carry handle that you can easily use when traveling or if you have to move from room to room. It also has a built-in motor that is operated by a battery that enables the swing. Its special features include height adjustable legs that allow parents to choose between the full-size mode and the compact one. It ensures that the baby is positioned at the best height for interaction. It has a power wheel that is easy to use. You can keep your baby entertained and visually stimulated with the two soft toys in the overhead toy bar. 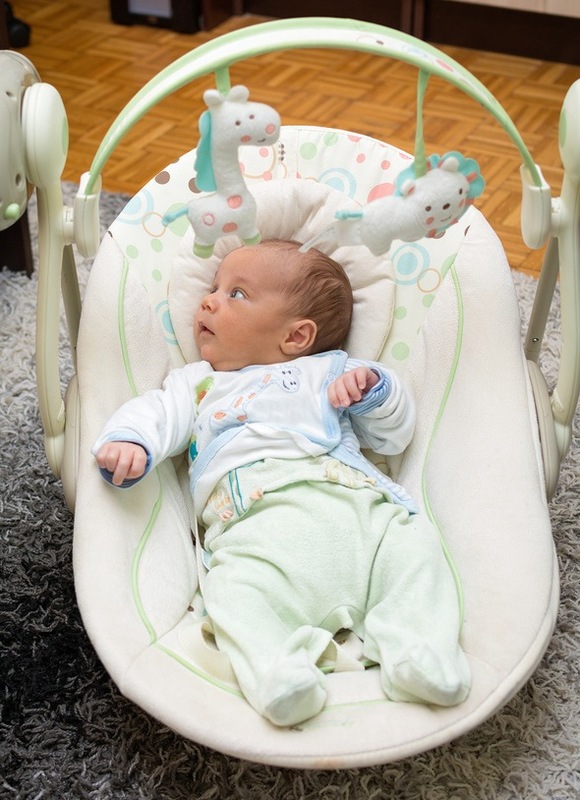 This compact infant swing is portable, easy to set up, and easy to fold back up for storage or traveling. You may find the battery life to be horrible and hard to charge because it is located on the inside of the pillar. Although the power wheel is easy to use, it also poses a danger if you have other kids in the house. They can easily turn it to high if you are not looking. You just have to be extra careful with that. That's the end of our reviews. Hopefully by now you've found the perfect swing for you and your child, and know exactly what you're going to buy. If you've got any more questions, or you've got something you'd like to add about the best baby swing, feel free to post it in the comments below. We always love hearing from our readers!